Global Gaming Expo Asia (G2E Asia) is the international gaming tradeshow and conference for the Asian gaming industry. Organised by the American Gaming Association (AGA) and Reed Exhibition, G2E Asia made its debut in 2007, defining itself as the preeminent show for the Asian gaming-entertainment industry. G2E Asia is an industry event offering a one-stop shop for gaming and entertainment products to the forward-thinking casino operators in Asia. It provides a cost-effective way to suppliers by enabling them to showcase new products, meet qualified buyers and establish new contacts. Every year more than 95% of Asian casino operators attend G2E Asia to look for cutting-edge products and solutions and gather information on upcoming industry trends. Held in Macau – the heart of Asian gaming – G2E Asia is the ideal hub where professionals can network and conduct business. G2E Asia 2016 scaled new heights with record-breaking attendance and the largest ever show floor. The three-day exhibition spanned a record 9,200 square meters of exhibit space, with 40% of the exhibitors making their debut at G2E Asia. More than 10,980 visitors from 83 countries and regions attended G2E Asia 2016. About 26% of attendees were senior management level, 950 serious buyers and VIPs with purchasing authority, at least 200 meetings between exhibitor and visitors were pre-arranged. Big names like Ainsworth, Aristocrat, Aruze, Asia Gaming, Astro, BB IN Technology, Bingotimes, Boller Technology, eBet, Generator Digital Technology, Golden Royal, Hydako, IGT, Interblock, Jumbo Technology, Konami, Oriental Group, RGB, SAGaming, Scientific Games, Xiang Shang International and Xin Wang Group will exhibit at G2E Asia 2017. 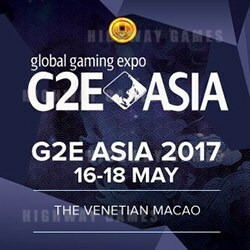 Big Gaming, Cuzco Holdings Limited, Dragon Games Technology, Golden Asia, GC Gaming, LD Gaming, LEBO, Itwinstars Technology, Ninetynine Technology, Rainbow Promise Solutions, Richwell Global Technology, Techasia Portal Corp, Wishland Software Technology, Inc will exhibit for the first time at G2E Asia 2017. The 2017 event will see the second instalment of the Asia Gaming Awards, and the launch of the Lex Mundi Global Gaming Legal Guide. Click here for the 2017 Exhibitor List. Click here for the 2017 Floor Map.